Some say getting there is half the fun. In Sacramento&apos;s case, you can save 100 percent of the fun for when you arrive, because getting here is the easiest part. We want you to be able to start enjoying great Sacramento attractions, accommodations and experiences as soon as possible. And there are a variety of quick and easy ways to get here. You just need to pick one. Sacramento International Airport was recently named fourth best airport in North America for customer service by Airports Council International (ACI), the international trade association for commercial airports. Sacramento International Airport is the gateway to Northern California and the world. It offers 11 airlines and more than 150 nonstop flights per day to over 35 destinations. The airport serves more than 10 million people annually. Sacramento International Airport is located 10 minutes from Downtown Sacramento hotels and attractions. It doesn&apos;t matter if you are starting out in Northern California or if Sacramento is just another stop on a long Northern California itinerary: Seeing our beautiful region by train is an experience in itself. 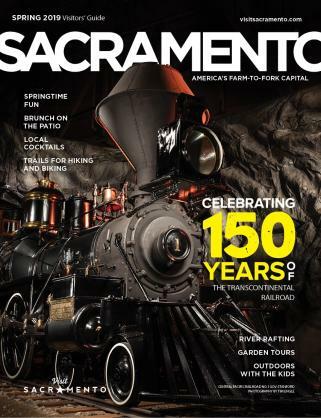 Amtrak links Sacramento to the Bay Area, the Central Valley and beyond. Traveling by train is convenient, scenic and easy. And our historic train station is located Downtown, steps from Old Sacramento and Downtown Sacramento hotels, shops and attractions. Click here for more information about Amtrak routes, trains and pricing. To receive a discount on Amtrak trains, click here. The Amtrak San Joaquin rail line offers a comfortable, convenient way to travel to Sacramento from locations throughout the state, while enjoying the ride! Daily trains feature spacious seating, free Wi-Fi, bike racks and a Café Car. 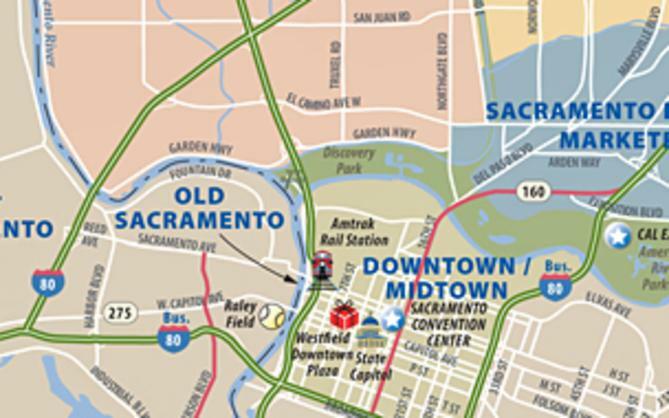 The Sacramento station is situated just steps away from Old Town Sacramento and just minutes from the capital. To plan your trip and to take advantage of promotional rates, visit AmtrakSanJoaquins.com or call 1-800-USA-RAIL. For a traffic-free, stress-free ride to Sacramento, hop aboard the Capitol Corridor train with service between San Jose and the Sacramento Valley Station and easy connections to Bay Area Rapid Transit (BART) at the Richmond and Oakland Coliseum stations. Visit www.RideCCRail.com for Capitol Corridor routes and schedules. Sacramento is one of California&apos;s most accessible cities by car. 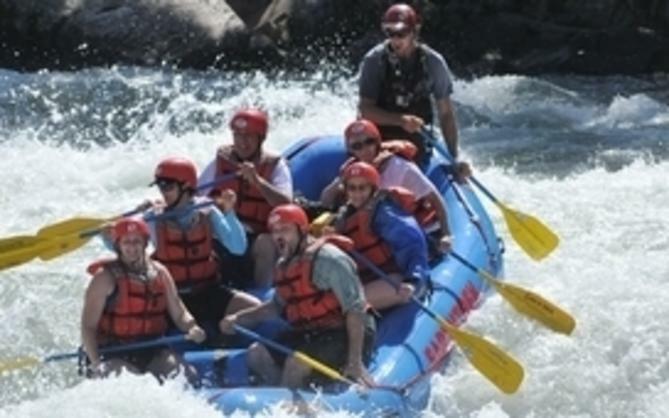 Whether you are coming to Sacramento from the Bay Area, the coast, the Central Valley or the Sierras, the Sacramento region is easy to access. While drivers should be mindful of usual rush hour times, Sacramento traffic is far less of an obstacle than many other large California cities. Also, Downtown Sacramento features a great deal of affordable parking for visitors. When you are traveling to Sacramento with your group, we know you pay close attention to how easy and convenient it will be to park and access your motorcoach. Our Tourism team will work with your group to make sure all aspects of bringing your motorcoach to Sacramento are fully taken care of. If you are traveling to Sacramento by Greyhound, you will be able to enjoy our new 10,000-square-foot LEED-certified terminal that features six bus bays, a sleek modern design and an onsite restaurant serving hot meals and snacks.